Rempel Insurance stands tall with Pembina Valley Twisters in the fight against cancer. 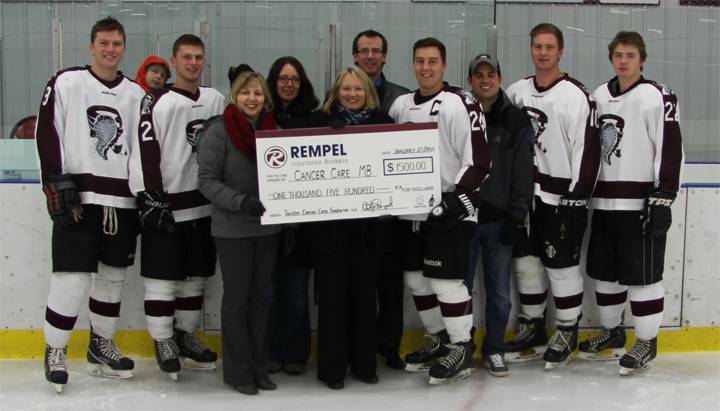 January 23-25, 2015 is the Cancer Care Weekend at the Morris Arena and Team Rempel has started the fundraising with a donation of $1500 to Cancer Care Manitoba. Silent Auction is open at the arena from 5-11 on Friday, and 9-7 on Saturday. Come out and support our local players in their “Hockey Fights Cancer” event.